PlayMakers: Company member for 12 seasons. Jump, The Cake, De Profundis, The Crucible, Trouble in Mind, Metamorphoses, Surviving Twin, A Raisin in the Sun, An Iliad, Noises Off, The Parchman Hour, Shipwrecked! An Entertainment, The Little Prince. 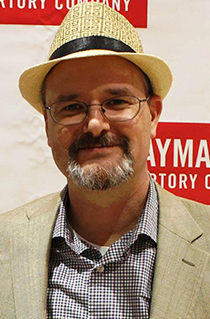 Mark teaches play analysis and playwriting in the Department of Dramatic Art. His plays The Will of Bernard Boynton and A New Dress for Mona have been produced in our Kenan Theatre, and both have now been published by Drama Circle. Mark has recently directed two classic plays with Kenan Theatre Company: Hedda Gabler and The Cherry Orchard. Education/Other: MFA, Playwright’s Workshop, University of Iowa. Former recipient of NC Arts Council Literature Fellowship for Playwriting.